(Nanowerk Spotlight) Quite a number of serious medical conditions, such as cancer, diabetes and chronic pain, require medications that cannot be taken orally, but must be dosed intermittently, on an as-needed basis, and over a long period of time. Researchers have been trying to develop drug delivery techniques with 'on-off switches' that would allow controlled release of drugs into the body. 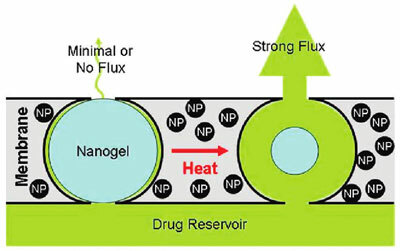 These methods use stimuli such as an implanted heat source or an implanted electronic chip to trigger the drug release from the implanted reservoir. So far, none of these methods can reliably perform all the needed actions: repeatedly turn dosing on and off, deliver consistent doses, and adjust doses according to each patient's need. By combining magnetism with nanotechnology, researchers have now created a small implantable device that encapsulates the drug in a specially engineered membrane, embedded with magnetic iron oxide nanoparticles. The application of an external, alternating magnetic field heats the magnetic nanoparticles, causing the gels in the membrane to warm and temporarily collapse. This collapse opens up pores that allow the drug to pass through and into the body. When the magnetic field is turned off, the membranes cool and the gels re-expand, closing the pores and halting drug delivery. No implanted electronics are required. "We have developed an implantable system that can provide on-demand, reproducible drug release whenever the patient – or other operator – wants, for as long as needed, and with the intensity that is desired, using a trigger that is external to the body – in this case an oscillating magnetic field," Daniel Kohane tells Nanowerk. "Most of the previously designed systems could only result in a single release event, or involved implanted triggering systems, or connectors to the outside world." Kohane, an associate professor of anesthesiology at Harvard Medical School and a senior associate in critical care medicine at Children's Hospital Boston, and his team have reported their findings in a recent issue of Nano Letters ("A Magnetically Triggered Composite Membrane for On-Demand Drug Delivery"). Kohane explains that composite membrane-based drug delivery devices have the potential to greatly increase the flexibility of pharmacotherapy and improve the quality of patients' lives by providing repeated, long-term, on-demand drug delivery for a variety of medical applications, including the treatment of pain (local or systemic anesthetic delivery), local chemotherapy, and insulin delivery. The membrane that Kohane's team developed consists of ethyl cellulose (the membrane support), superparamagnetic magnetite nanoparticles (the triggering entity), and thermosensitive poly(N-isopropylacrylamide) (PNIPAM)-based nanogels (the switching entity). Membranes were prepared by co-evaporation so that the nanogel and magnetite nanoparticles were entrapped in ethyl cellulose to form a presumably disordered network. To facilitate effective in vivo triggering, the nanogels were engineered to remain swollen (i.e., in the 'off' state) at body temperature. "When we subjected the magnetic nanoparticles embedded in the membrane to an external oscillating magnetic field, they heated inductively," explains Kohane. "The heat generated by magnetite induction heating was transferred to the adjacent thermosensitive nanogels, causing the nanogels to shrink and permit drug diffusion out of the device. When we turned off the magnetic field, the nanogels cooled, causing them to reswell, turning off the drug flow and refilling the membrane pores." The researchers observed a 10- to 20-fold differential flux between the 'off' and 'on' states. Furthermore, multiple on-off cycles could be performed without significantly changing the permeability of the membrane in the off state. The on-off action doesn't occur immediately but was much more rapid than that seen with bulk, interpenetrating hydrogel networks. The devices turned 'on' with only a 1-2 minute time lag after the solution temperature reached 40°C and turned 'off' with a 5-10 minute lag after the stimulus was switched off. Kohane points out that reproducibility will clearly be a key consideration in devices of this type, especially with drugs with narrow therapeutic indices. "We have shown excellent reproducibility over four magnetically induced cycles" he says. "The maximum number of cycles over which that reproducibility can be maintained remains to be determined, as does the number of cycles over which it needs to be maintained. The latter will depend to a large extent on the specific clinical indication and the expected duration of therapy. Some devices might only need to be triggered a few times, while others – e.g., for a chronic condition requiring treatment several times a day – might require reproducible triggering over thousands of cycles. This issue will be of great importance in the downstream development of the device. Indeed, the ultimate design of a clinical drug delivery device based on this membrane technology, including the specific materials of which it will be composed, is yet to be determined."